Old buildings or monuments from that period have all been razed to the ground, as the country came under numerous waves of conquest. Nevertheless, if we dig deep into the city’s layers we are bound to find a lot of Islamic heritage. King Vakhtang Gorgasali of Kartli founded Tbilisi in the 5th century. The city got its name from the Georgian word tbili, which means warm. That is courtesy of the natural springs found in the city. These springs, often referred to as sulphuric baths due to the high concentration of minerals its water contains, attract hordes of tourists who come to enjoy the alleged rejuvenating qualities. 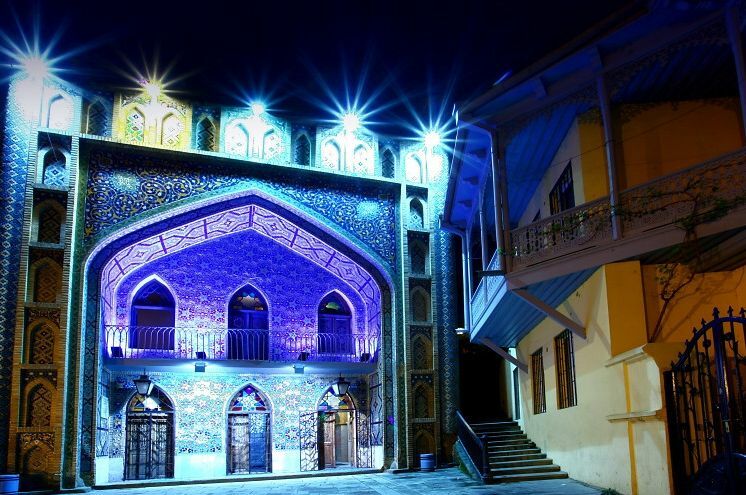 The Orbeliani Baths are located at close proximity from Tbilisi’s Old Town. The baths are gender segregated and there are private ones as well. In many ways the baths resemble Turkish hammams, offering a reviving and pampering experience that will leave you feeling fresh and relaxed. You can’t miss Orbeliani Baths as they will grab your attention with their distinct domes and façade. The blue tiled façade comes adorned with geometrical patterns typical of Central Asian Turkish architecture: a hint of Islamic heritage right in the heart of the Georgian capital. 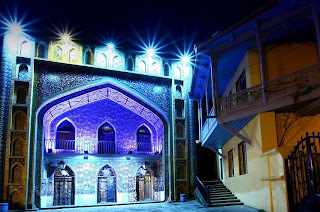 A stone’s throw away from Orbeliani Baths is Tbilisi’s sole functioning mosque. Dating back to 1895 the mosque miraculously survived the communist era with all its notorious purges. The mosque comes with a brick-made exterior, which gives it its distinctive red color, and a white minaret tip. The interiors, however, blend different Islamic architecture styles, mixing subtly decorated sidewalls with a mihrab (a niche indicating the direction of Makkah) that is heavily decorated with blue-toned calligraphy and floral designs. Tbilisi’s Old Town is perched on a mountain overlooking the modern city. Taking your way up you will pass many cobbled alleyways lined with old buildings and various religious houses. At the very top a 20-meter aluminum statue known as Kartlis Deda, Mother Georgia, will greet you. The female statue holds a sword in one hand and a cup of wine in the other. It is the best example of the Georgian character; the generous people will greet their friends with the best they have, but will fiercely defend their land if approached by enemies. A short stroll from Kartlis Deda is Narikala Fortress. The city’s most famous defensive structure dates back to the 4th century. The Persians built its foundations, while the walls were constructed during the 8th century when Arabs ruled the city. At that time, the Emir’s palace was actually inside the fortress. Narikala offers superb panoramic views of Tbilisi.